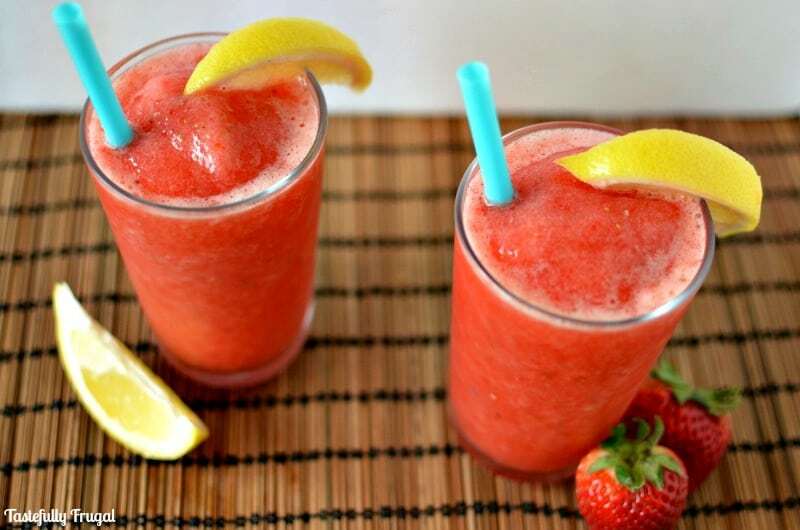 Cool down in the summer heat with this Copy Cat Sonic LemonBerry Slush. If you have been reading Tastefully Frugal for any time you know by now that I love making copy cat recipes. Whether it’s Chick-Fil-A Sandwiches or my favorite Chili’s Honey Chipotle Chicken Crispers, I love taking my favorite restaurant meals and treats and turning them into make at home favorites. Now that it’s getting hot outside my cravings for Sonic Slushes have gone from a few times a month to a few times a week. Which wouldn’t be too bad if I could hit their happy hour between 2-4pm; but that’s usually when the boys are napping. Plus when I was looking into making slushes at home I found out that Sonic puts 5 pounds of sugar in every one gallon of water to make their slushes… FIVE POUNDS!! No wonder they taste so good; you’re basically drinking straight sugar with a little bit of ice. Our favorite slushes to get when we go are the real fruit slushes because they have less artificial colors; which make my boys crazy! My favorite being the Lemon Berry; a mix of strawberries and lemons with shredded ice…aah the perfect way to cool down on a hot summer day! So of course I had to try to make these at home so whenever the craving struck I could indulge myself. 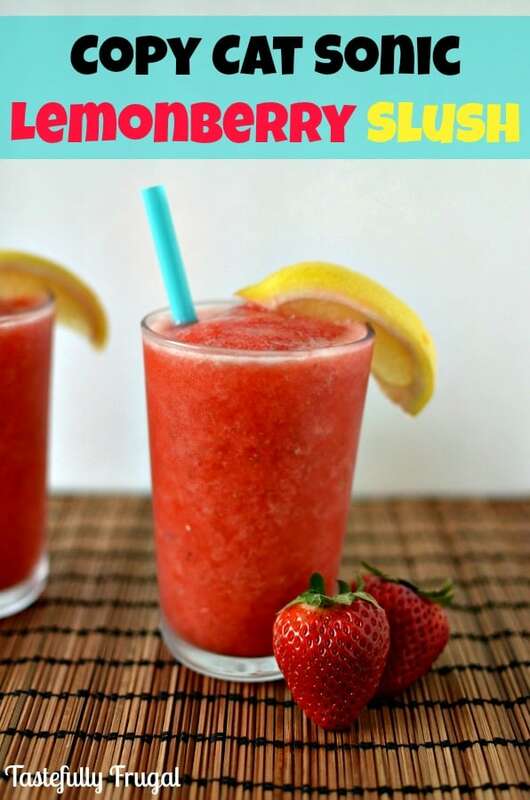 They are so easy to make and you can adjust the amount of lemons and/or strawberries to suit your taste buds. The version I made tastes JUST like the real version too! So if you’ve got 2 minutes and a blender you’ll definitely want to give this recipe a try! Swwet strawberries mixed with tangy lemons create the perfect cool treat. In a blender (I love my Blendtec) crush ice. Set ice aside in a bowl. 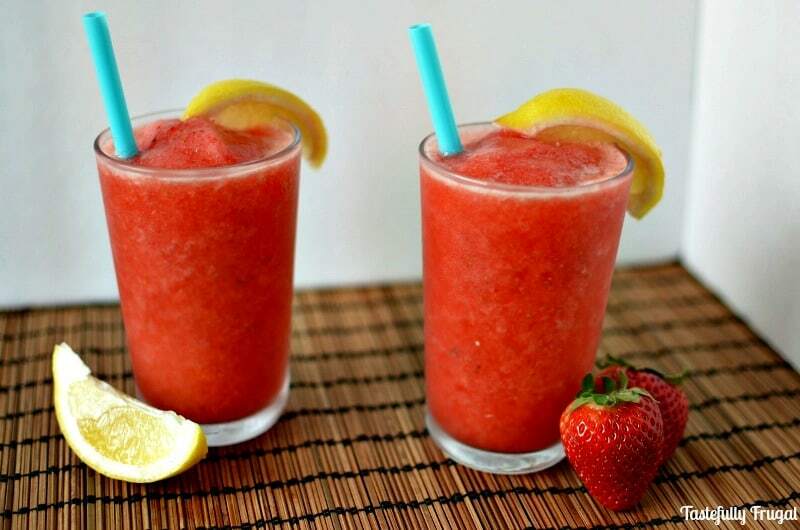 Place strawberries and lemon in blender and puree for 15 seconds. Add club soda and sugar and mix for another 15 seconds. Add ice back into blender and blend for 5-10 more seconds. If you don't have lemons on hand you can substitute 1/2 cup lemon juice. What’s your favorite slush flavor? These slushes were part of our Monthly Ingredient Challenge and the ingredient for May was lemons. Check out these other great lemon treats! Looks delicious, Sydney! Perfect for summer 🙂 Pinning! Thanks so much Kendra! I LOVE your Blueberry Citrus cake too… can’t wait to try it! I love all things Sonic!!!! Definitely going to give this recipe a try it looks awesome! Ahhh, that sounds so good right now! And so easy. Definitely going to be trying these out soon. They are super easy to make Leia and delicious! I would love to hear what you think of them! My daughters are obsessed with slushies! I have to make this for them, all that sugar in the store bought slushies is crazy! Pinning! Awesome Roxanne! I would love to hear what you and your girls think of them! I absolutely love a slush to cool down on a hot summer day! Yum! They are perfect aren’t they?! Holy geez, five POUNDS!?! Why you gotta do that to us Sonic?? I bet yours is a gagillion times better too, perfect for summer! I know, right?! These are so good and I love the natural sweetness the strawberries bring to it vs. artificial sugar. These look great Sydney! I can’t believe that Sonic slushes have that amount of sugar! This homemade recipe is a great way to still enjoy the flavor and not have so much sugar. Thanks Ali! Yeah they use SO much sugar! Definitely give these a try and let me know what you think! I am addicted to lemonberry slushes, but even though I ask for “diet” (they said they use sprite in them), now I know I can’t fool myself any longer about their calorie content! 🙁 Glad to have another option! I’ll be trying this myself this summer and I think I’ll try to whittle the sugar down to as little as possible while I’m at it! Just found your blog and loving it already! They are so good right?! But not so good for you! I’ve made them without any sugar and they still taste good but the little extra sugar makes them taste just like the real thing. So glad to have you visit! Since our nearest Sonic is 45 minutes away, I’ll have to try this once our new blender arrives. It’s a great way to use summer fruit! I’ve never had anything from Sonic, I don’t know if they have them in Canada, but this sure looks great, and not complicated. Thanks for linking up this week. I am pinning it to the Creative K board on Pinterest. You totally should Jess they are so good!! Thanks so much for hosting! Love partying with you!